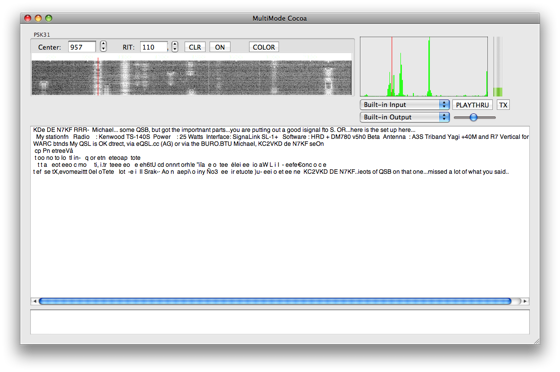 MultiMode allows you to decode and transmit morse code (CW), RTTY, FAX, SSTV, SITOR-B, NAVTEX, PACKET, ACARS, PSK31, ALE, and many other modes on your Macintosh, without any extra hardware. Just connect your Mac to your radio, and you're all set to go! We have a page all about getting started using MultiMode, which is a great page to begin learning how to use the app. Download a copy of MultiMode OSX right now, to try out without obligation! The cost of buying MultiMode OSX is only $89! MultiMode requires a Macintosh running Mac OS X 10.6.8 or later, and works great on macOS 10.13 High Sierra. If you are running an older version of Mac OS X, please visit the download page to see what versions may be available for your system Please feel free to download a copy prior to purchase, and see how it works on your system. You also need a radio capable of tuning in the frequency ranges of interest. If you want to transmit, you'll need a transceiver of course. For most modes, this is a shortwave radio. 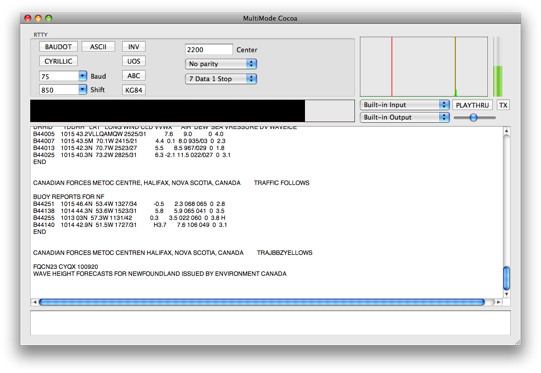 For ACARS mode, a common VHF band scanner is used. For transmitting, you simply connect the audio output of your Mac to the microphone input of your transmitter, possibly through an isolation transformer. There are many devices on the market that can do this for you, or you can do it yourself. As of now, the following modes are implemented, some receive only, those with an asterisk (*) next to them support transmitting. A waterfall display has been added to PSK-31 mode. Now, you can see a 1600 Hz wide section of the band all at once. Just click on the transmission of interest, and MultiMode will automatically set the center frequency, making tuning PSK-31 transmissions easier than ever! MultiMode requires Mac OS X 10.6.8 or later, through macOS High Sierra 10.13. If you have an older version of Mac OS X, please check the download page for older versions. The cost of registering MultiMode is only $89! 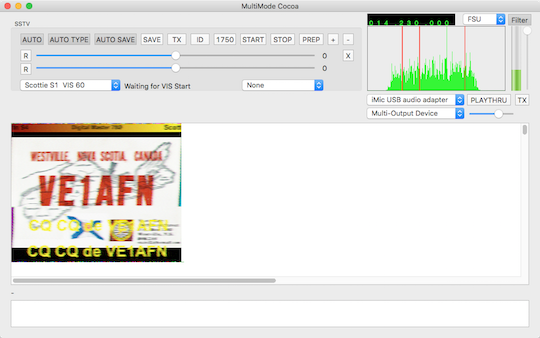 MultiMode can control SdrDx, an SDR app that supports RFSPACE, FunCube Pro, Andrus MK1.5, AFEDRI, FunCube Pro Plus, Peaberry, and Softrock SDR receivers.